The Nigerian militant group Boko Haram has pledged allegiance to the Islamic State, according to reports citing an audio message. The message, published on Boko Haram’s Twitter account cannot be immediately verified. According to reports, it was likely to have been recorded by the group’s leader. Jihadist monitoring group SITE said that it was Boko Haram leader Abu Bakr Shekau who formally pledged the allegiance to Abu Bakr al-Baghdadi, the self-proclaimed leader of the Islamic State, Reuters news agency reported. In his speech the Boko Haram leader reportedly said the group would “hear and obey” the Caliph “in times of difficulty and prosperity”. Last June ISIS jihadists declared the captured areas a new Islamic State – a caliphate. The ISIS leader Abu Bakr al-Baghdadi proclaimed himself a caliph and urged other radical Sunni groups to pledge their allegiance. Shortly afterwards, the head of Nigeria’s Boko Haram radicals vowed support for the Sunni Islamic State extremists and other Islamist groups in a video statement. In November, numerous jihadists from Egypt, Algeria, Libya and other countries pledged allegiance to the Islamic State. This January, Afghani and Pakistani militants also joined the Islamic State, claiming they constituted its province. Boko Haram has grown from a small terror group to a mini-country with its own territory, which can be compared to gains made by the Islamic State (IS). 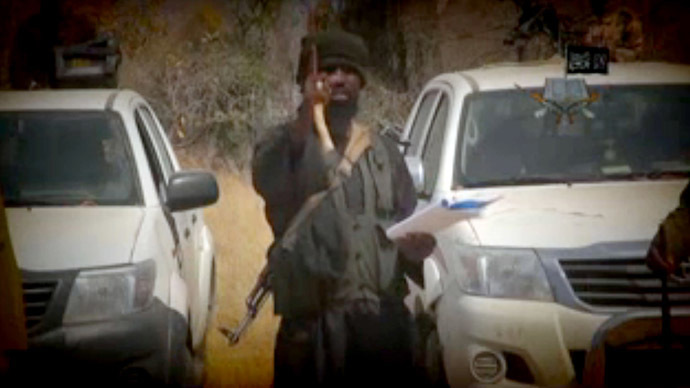 Boko Haram now controls an area the size of Slovakia. The militant group’s territory now totals about 52,000 square kilometers, according to an estimate released by The Telegraph. One of the latest towns to be captured by the group was Baga in the northeastern Nigerian state of Borno, close to Lake Chad. According to witness estimates, Boko Haram militants killed at least 2,000 people there, although the Nigerian military later put the figure at 150. Last April the group attracted unprecedented global attention with an abduction of nearly 300 schoolgirls in the town of Chibok. The incident was globally condemned. Boko Haram's attacks have caused great concern not only in Nigeria, but also in neighboring countries. The African Union Peace and Security Council have authorized a force of 7,500 troops from Nigeria, Chad, Cameroon, Niger, and Benin to fight the militants. UN Secretary General Ban Ki-moon also approved the plan. Boko Haram atrocities are estimated to have left at least 13,000 dead since the insurgency began in 2009. Around 1.5 million people have become internal refugees due to the violence, soaring from 600,000 in the past six months, according to the UN. The group was founded in 2002 but its increasing radicalization started after an uprising in 2009 when the militants began carrying out massacres, kidnappings and raids.